And here is part 2 of the review of the Miromoda Maori fashion show held last month during New Zealand Fashion Week. 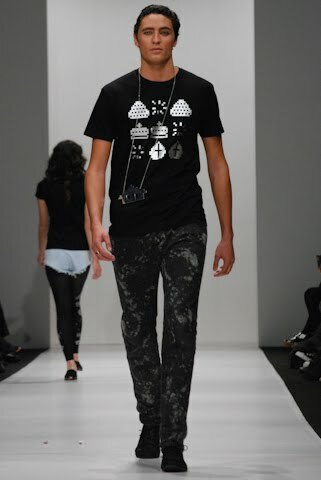 Miromoda Emerging Designer winner, Adrienne Whitewood offered a collection that captures the imagination of urban-wear that seemed to take you on a journey’s reminiscent of Arabian Nights. Velvets come in cocoon-ish wraps and effortless shapes that look comfortable and very wearable. Colours are dark blues highlighted with shades of russet. 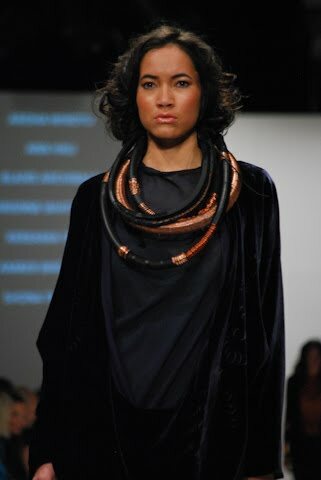 Copper jewellery bedecks the wrists and décolletage in thick wire coils. Linen sheaths, slouchy trousers and muslin fabrics compliment a collection that allowed comfort, style and innovation to co-exist so invitingly. 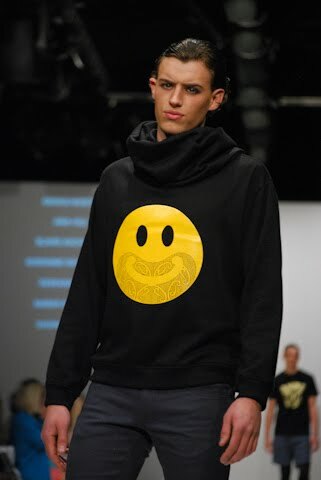 I loved this collection from Urban Maori designer Kereama Taepa. Wit and caricature abound in this collection and welcomed too. Prints are nostalgic of growing up in the eighties and nineties. The ever-present ‘have a nice day’ face had a make-over with an amusing moko motif. Does anyone remember the arcade game called ‘Galaga’ that use to clutter the entrance to take-away shops? Prints similar to that archaic game are utilised in neon colours lighten up the side of leggings or wherever applicable it seems. Denim arrives in cropped shorts with unfinished edges for woman; men’s denim shorts and pants are fitted or straight-cut. 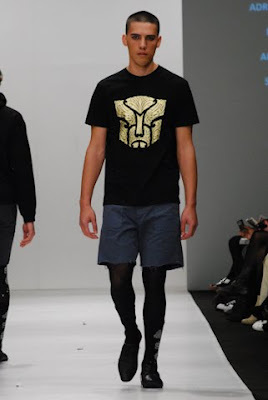 An Autobot printed shirt also gets the Maori-ised makeover, and I expect to see young people wondering about, proudly sporting such entertaining and fun street-wear. Dunedinite Amber Bridgeman, with her label Kahuwai excites inspiration Maori mythical super heroes. 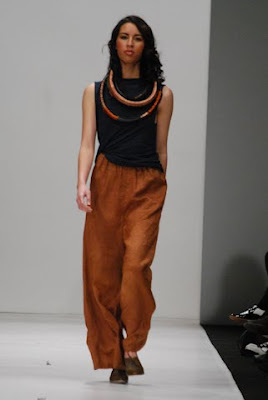 Her ethos is to give a homely sense to apparel that is authentically made in Aotearoa. Each piece is features indigenous artwork using New Zealand made paints and made from sustainable fabrics. So this collection was embellished with feathers, prints and strong details that aligned itself in-theme. 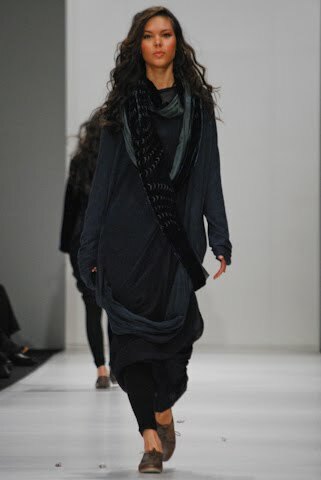 Merino dresses had versatile additions – wrap-like details that drape across the shoulder like a pashmina, suddenly becomes a train. Colours popped right at you in emerald greens, reds as well as black and white. Ensembles were usually bi-tonal and prints were inserted at the sides, sleeves and on the back of that train in a repeated motif. The clothes for men had an ease about them, something that just said you could just chuck-on and go. 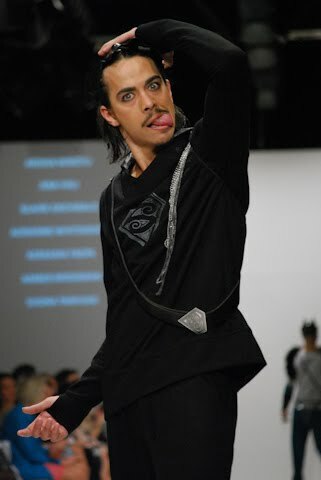 Male models wore batman masks and unmasked at the end of the runway, posed in haka-like stances with a fearsome pukana. Our man Hunter McLeod was fortunate to take on this task. To the point, Amber Bridgeman’s collection had mana, wearability and poise. Lastly, Shona Tawhio stood out from the rest with her masterful skills of weaving flax into unique and exquisite sculptures. Tawhio is a fibre artist and an acutely adept one too. 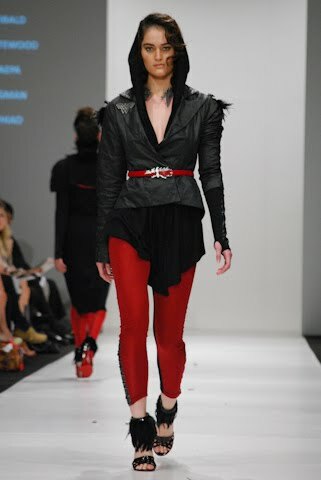 Her collection is entitled ‘Te Whiri’ and based on traditional warrior attire. A spectacular interpretation of a corset and skirt piece was exceptional, finished flawlessly in a black lustre and even more, the corset was held together with steel clasps that continued high finish details. 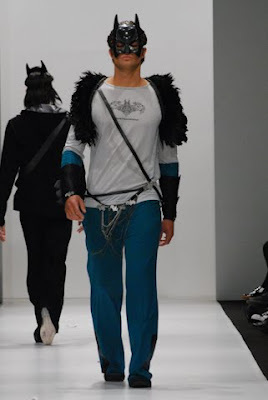 Armour-like chest plates looked tough as steel and woven head pieces complete a regimented look. Tawhio is like no other weaver/ fibre artist that I personally have encountered and is one to look out for in future.